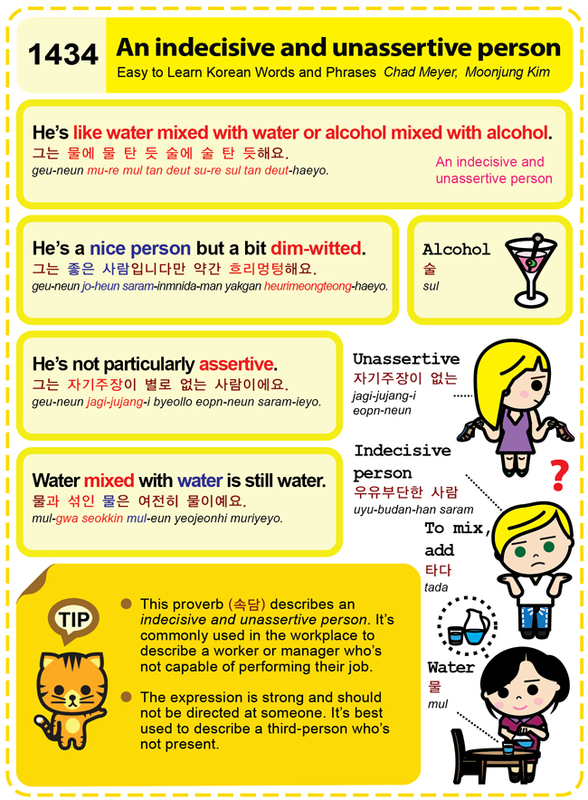 Easy to Learn Korean 1434 – An indecisive and unassertive person. This entry was posted in Series and tagged add, alcohol, He’s a nice person but a bit dim-witted., He’s like water mixed with water or alcohol mixed with alcohol., He’s not particularly assertive., indecisiveu, manager, proverb, sul, to mix, unassertive, water, Water mixed with water is still water., worker, workplace, 그는 물에 물 탄 듯 술에 술 탄 듯해요., 그는 자기주장이 별로 없는 사람이에요., 그는 좋은 사람입니다만 약간 흐리멍텅해요., 물, 물과 섞인 물은 여전히 물이예요., 속담, 술, 우유부단한 사람, 자기주장이 없는, 타다 by easykorean. Bookmark the permalink.